Please accept this description in lieu of photos of cityscapes, as I failed to document the goings on around me — partly because of the cold (hands stayed in pockets! ), but also because I hate that touristy feeling I get when surrounded by lots of other folks taking pictures of tall American buildings. I’d rather blend in and participate in daily life. Clearly, this conflicts at times with my desire to be a better recorder/documenter of my life. Something to work on. Speaking of working on, I have much knitting progress to share. First up, my Brompton progress. You will recall that I managed to acquire the yarn for this project and swatch just before leaving on Friday. 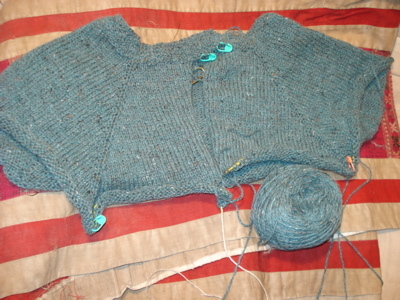 I’m in the increase section, and I’m just about ready to divide the sleeves and body. Had to stop knitting on this on the plane home, as I realized it was about time to put it on waste yarn and try it on. This is rather difficult to do in an airplane seat. The color is far greener than this picture, but I love how this highlights the tweediness of the yarn and the beauty of the basketweave stitch. I was worried that a tweedy yarn would obscure the stitch detail, but I am really happy with how this is turning out. 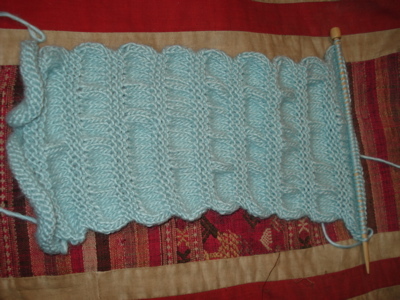 I also managed some progress on the gathered scarf. The Blue Sky Alpacas Suri Merino is so soft, and I love how this scarf is draping. This is a slower knit, due to the constant needle switching every five or so rows, but this is worth it. Also, ta-da! 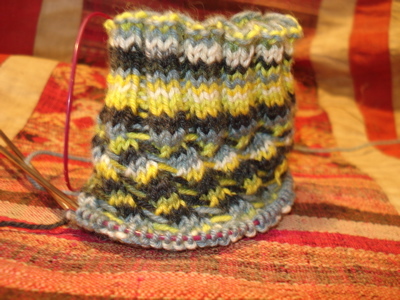 My first attempt at Magic Loop, in the form of Schrodinger’s Twisted Tweed Socks. I am very excited about these, as this method is so much faster and less fiddly than using DPNS — particularly valuable on an airplane. 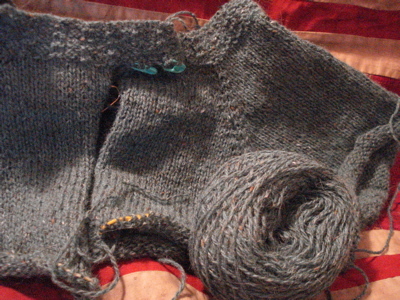 I am using KnitPicks circulars, size 2, 32 inches, and while the cable is nice and flexible, I did manage to yank the cable out of the needle. I don’t think I pulled very hard on the cable, so that was frustrating. I managed to push the cable back into the needle, but the join is a bit awkward, and a bit more predisposed towards separating again (happened once more, though I was being extra careful). I’m sure part of this is my fault — I know that tightening the first stitch too much is a common problem when learning Magic Loop, but I was a bit disappointed, as this is my first time using this particular circ, and the join will never be smooth. Phew! Long knitting update. Sun is shining, and I have the morning to get my life in order before heading to the office this afternoon. Boh is curled up in his favorite spot, snoring. All is well. This entry was posted in knitting and tagged blue sky suri merino, brompton, Eilen Jewell, gathered scarf, knitting, magic loop, NYC, rowan felted tweed, trekking xxl, Twisted Tweed Socks by barefootrooster. Bookmark the permalink. Are you sure you have only been knitting a short time? Love the look of that scarf. Definitely will check out Eilen Jewell. Your Brompton is going to be great, what a terrific yarn choice!